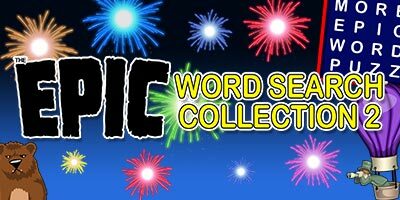 The Epic America Word Search – Celebrate the very best of America – with fireworks! Travel Route 66, head west for the Gold Rush and explore America’s parks and beaches; take in a ball game, eat the ultimate hamburger and look up at skyscrapers. They even put a man on the moon – can you find him? 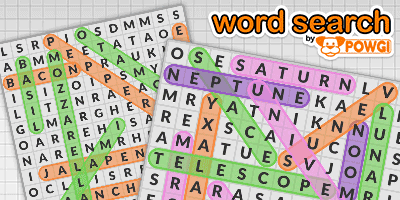 The Epic Ancient Word Search – By Zeus, it’s historic! Encounter leaders and deities from ancient Greece, Rome and Egypt; visit Stonehenge, Pompeii and the Great Wall of China and take part in the ancient Olympic games. 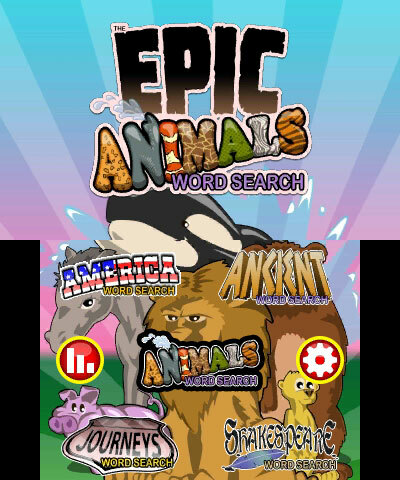 The Epic Animals Word Search – The furriest word search you’ll ever meet and want to tickle the tummy of! Go “eww” at creepy crawlies and “aww” at baby animals; visit the depths of the ocean and make a whole bunch of animal noises. 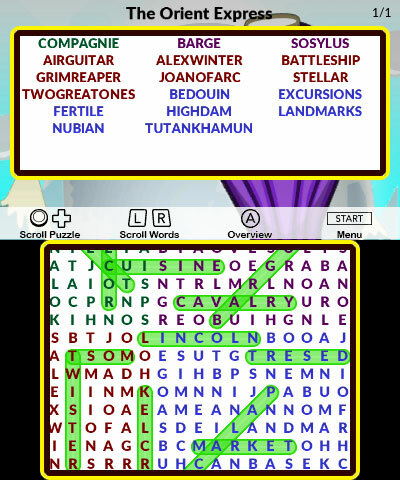 The Epic Journeys Word Search – Fasten your seatbelt! Travel in luxury on the Orient Express, go off-road through the Australian outback, explore the ancient Silk Road and embark on an expedition to conquer Mount Everest. 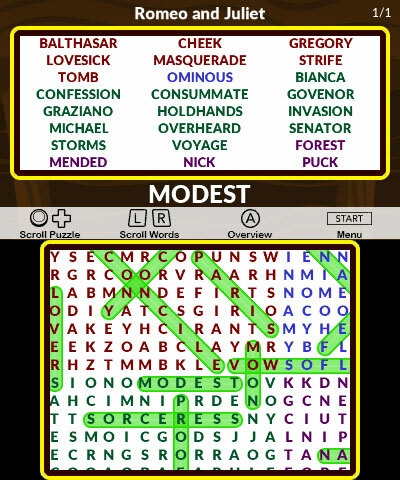 The Epic Shakespeare Word Search – Shall I compare this puzzle to a summer’s day? 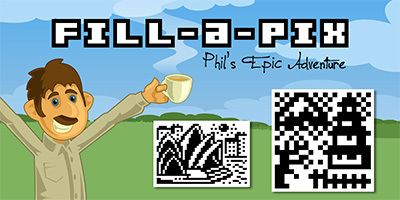 Enjoy the verbal wit of the Bard of Avon with this puzzle based on Shakespeare’s best known plays. Friends, Romans, countrymen, find me some words! 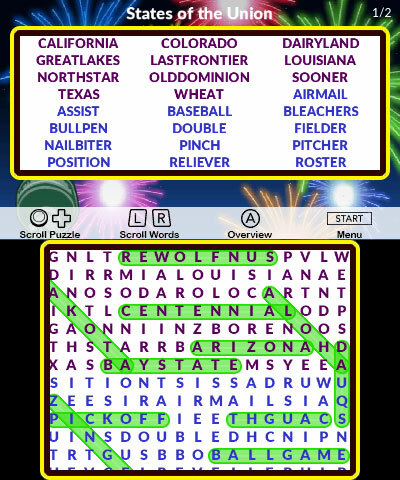 Each epic puzzle contains over 1,500 words, hidden in a grid that’s much too large to fit on screen! It takes many hours of gameplay to solve each one. Scroll with the +Control Pad or Circle Pad, then touch with the stylus to highlight words. 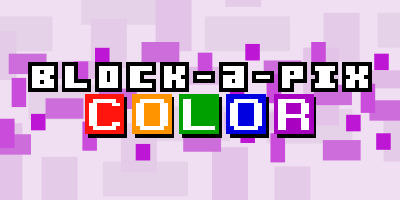 Jump straight in and get solving right away with this fast-loading game. Switch between puzzles at any time and share your progress with other players using StreetPass™.